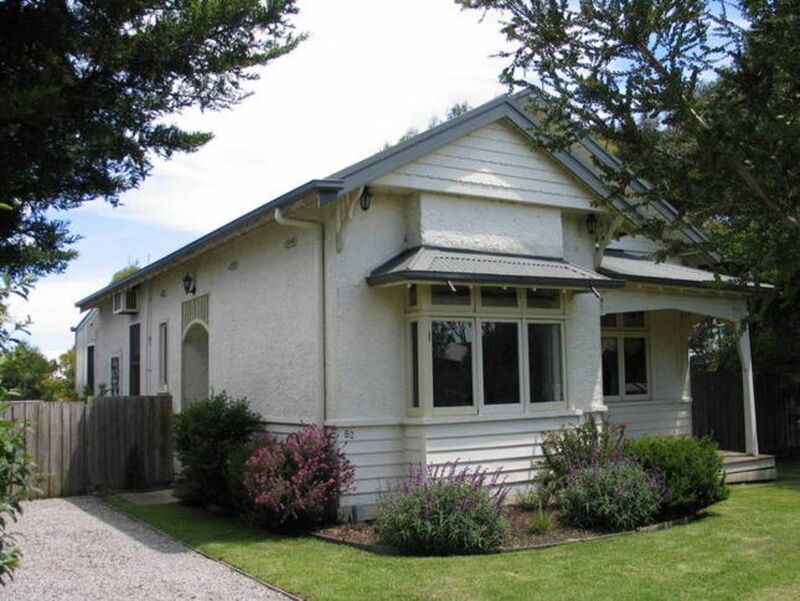 This beautifully renovated Edwardian three-bedroom home is perfect or your next family weekend or quiet coastal getaway. Retaining many period features, and tastefully updated, the house can sleep six guests comfortably and has a fully-fenced rear yard to allow you to bring your pets (please see Pet-Stay terms below). Located just a short walk to local cafes, surf beach and the beautiful Inverloch dog beach – Veronica Street is your ticket to a relaxed and low fuss weekend away. The property’s three separate bedrooms, include two queen size beds and two king size singles and can sleep up to six guests comfortably. The cosy lounge room, outdoor deck and well-appointed kitchen are perfect for relaxing at home and a stroll along the foreshore takes you to downtown Inverloch, and all it has to offer, including great coffee, restaurants and cafes, and of course, the famous Inverloch Esplanade Hotel (with a courtesy bus for the trip home!). Family-friendly fun includes a fantastic playground at Rainbow Park only minutes from the main street, safe and patrolled beaches, and of course an abundance of wildlife and natural beauty. Or take the kids for an afternoon at Dinosaur Dreaming, and let them learn about the area’s prehistoric history. Inverloch is your gateway to all that Bass Coast can offer, from beachcombing along the beautiful sandy expanses of Venus Bay, to exploring Anderson Inlet and the splendour of Bunurong Marine National Park. Venture further afield and you can take a trip to the majestic Wilsons Promontory or visit the Penguin Parade at Phillip Island. Whatever your pleasure, whatever you feel like, you will be able to find it all in and around Inverloch, and few nights of staying at Veronica Street, will have you relaxed refreshed and ready to go! Please find below some information that will help make your stay even more enjoyable. •	Check in time is 2pm. Please check out by 10am on the day of departure. •	Please bring you own linen. Doonas and pillows are provided, however, please bring your own doona and pillow cases (linen hire is available at nearby Wonthaggi, if you are travelling without). •	There is off-street parking. •	The beach is less than 600 metres away! Of course, we are really keen to ensure you get the best out of your stay, so please feel free to send any enquires or questions via HomeAway, and we’ll get right back to you! Veronica St, Inverloch, absolutely loves animals and welcomes guests travelling with their furry companions. Your dog will enjoy a securely fenced backyard to run around and play, chase a ball, laze in the sun and take in the fresh air. Alternatively, take your dog for a walk along the beach (for more information regarding local council designated ‘off leash’ areas, including a dog beach, click here). [LINK . Furry friends are more than welcome inside the house as long as they are a small-medium breed, house-trained, well-behaved & adhere to our Pet-Stay Terms. The backyard is fully fenced to give you peace of mind if leaving your pets outside. However, the house is weatherboard and there may be small gaps under the house. It is recommended that small dogs such as Chihuahuas be supervised at all times. Water & food bowls are not provided so please ensure you bring them along, including their own bedding for them to sleep on. •	No more than two dogs staying at any one time. •	Pets must be house-trained and non-aggressive or destructive. •	We do not permit dogs that scratch to get in or out. •	Furry friends must be in good health, clean, well-groomed and free from fleas & ticks. •	No pets are permitted to toilet inside the house under any circumstance. Owners must clean up ‘deposits’ around the house area and dispose of them thoughtfully. Note: droppings should be bagged and placed in appropriate bins. •	Pets are not to be left alone inside the house at any time. You must advise us if you intend to leave the property and want to leave your furry friend outside whilst you are away. We will not be held liable for any incident that may occur whilst your pet(s) is left unattended on the property. •	Please do not allow your pet to chase, catch or disturb native wildlife. •	The owner reserves the right to ask any guest with a pet to leave immediately if the above terms are not followed. By making a booking at Veronica St, Inverloch, you are agreeing to our Pet-Stay Terms as stated above. ** Please note excess cleaning resulting from not adhering to the Pet-Stay Policy. You will be held accountable for the full cost to replace/or repair any damage resulting from your pet’s stay, and an invoice will be sent to your registered email address. How to get to Inverloch Inverloch is less than two hours from Melbourne. Travel along the South Gippsland Highway from Melbourne, turning onto Bass Highway to follow the road through Grantville, Bass, Kilcunda and Wonthaggi before reaching Inverloch. History of Inverloch - Ancient middens discovered in the area are testimony to the seafood diet of the Bunurong Aborigines who once occupied this stretch of the coast. The Bonkoolawools are also thought to have hunted in the region. - The first European to settle in the Inverloch area was Samuel Anderson, who, together with his brothers and Robert Massie, ran cattle and grew wheat in the area. - The inlet on which the town is situated on is named Anderson Inlet after Samuel Anderson. The town was first named Andersons Inlet and later renamed Inverloch after Loch Inver (Lake Entrance) in Scotland. - The Post Office opened on 1 September 1883 as Anderson's Inlet and was renamed Inverloch in 1889. - As the area developed Inverloch became a port for the shipment of black coal from Wonthaggi to Melbourne. - Australia's first dinosaur bone, the Cape Paterson Claw, was discovered near Inverloch in 1903. Today, the Dinosaur Dreaming fossil excavation at the Flat Rocks coastal site by Anderson's Inlet attracts both Australian and international visitors. Inverloch - The Town Today - Inverloch is a popular tourist destination, particularly for surfers, kitesurfers, windsurfers and fishers. - The town hosts a jazz festival each Labour Day long weekend in March. - Like most other Australian coastal towns Inverloch has a local surf lifesaving club. - It is constantly changing and at low tide its sandy bottom is exposed and many species of waterbirds banquet on the shores. Renovated old world charm, in Veronica street. This lovely quiet street, is away from the hustle and bustle of town. Some great walkways are found throughout Inverloch, it’s a little secret known by locals. If you are keen to discover them, start at the one just through the park around the corner from my house. if you take the correct turns, you can get to the surf beach at a leisurely stroll in around 10 minutes. Bathroom it is well proportioned, but isn't as large as some would like. It has storage and is centrally located, renovated with a small step in bath, with overhead shower. Inverloch Golf. Transformed from an old vegetable garden into a 9 Hole Golf Course. Leongatha Golf Club is a classic Vern Morcom design that has been a hidden treasure in Victoria’s South Gippsland . Old style, but neat, clean and tidy! Great place to get away, neat and tidy accommodation and great distance to beach, shops, and bike/walking tracks. Would recommend the property. A very pretty property with lovely old fashion feel. Very basic. The property was nice looking and quite clean. Something left in the grill which we didn’t touch and not having a dishwasher the cutlery and plates not feeling to clean. We had no hot water either for about 12 hours of our stay. It’s not cost effective to heat hot water all day, every day especially when the house isn’t being used. This means that the hot water tank is heated up overnight at off peak times. It’s very important that you understand that If you take long hot water showers you could run out of hot water. The tank has 250 litres hot water capacity and is adequate for 6 people. We absolutely loved our weekend at this property in Inverloch. It was just what we needed. The property was neat and clean and had a lovely old world charm to it. We came back rested and re charged. The walk to the town centre on the beach was perfect. Thank you, Chrissy! Neat house with lots of character. Comfy beds, and living area. Excellent location. Very small bathroom. The house has very large bedrooms. I sincerely apologise that the bathroom isn’t as large as many modern homes these days. It is well proportioned and is still functional. We were very blessed to stay in this tranquil seaside cottage full of old world charm. The house has everything you need for a perfect holiday, including being only seven minutes walking distance from the beautiful, dog-friendly surf beach of Inverloch. The bedrooms and lounge room are very spacious with high ceilings and fans. The bird life added extra delight and the koala in the front tree added even more to an already incredible habitat! The village of Inverloch is lovely and the locals are very friendly. We will definitely be back! Good property. Close to town centre and beach. Well kept, clean and confortable. Property has all amenities required.